The meeting, which many have deemed “kowtowing,” appeared to be another signal that Facebook is making a play toward China after being blocked in the country since 2009. This comes on the heels of Zuckerberg’s China visit in October and the company setting up a Beijing sales office in May. Chinese state media has even started taking a Facebook entry seriously, suggesting that if it wants to come in, it will probably have to find a domestic partner. Under Xi Jinping, there’s been an intense crackdown on pretty much every sector of society—media, education, NGOs, etc.—with the Internet being foremost among them. So if China is seriously considering letting Facebook enter, why now? One important thing to understand is that sites like Facebook, Twitter and YouTube have been blocked not only to censor their political content, but also as a means of boosting local Chinese counterparts. This has clearly worked, allowing social media industry jobs to remain in China while making sure that the most popular networks are the ones most easily controlled by Communist Party authorities. In the past half-decade since the big foreign sites were blocked there’s been a golden age in Chinese Internet development. Weibo and WeChat, China’s two largest social networks, have seen their user bases grow from nothing to hundreds of millions, making them the clear social media winners. So if an outside contender is allowed to enter now, few, if any, Chinese users would adopt it as their social network of choice. It would simply be something to use on the side if they want to connect with people internationally. Thus, there’s little commercial threat in letting an outside player like Facebook re-enter at this stage. On the contrary, there are some compelling reasons for the Chinese government to allow Facebook in. One is financial. If, as state media is starting to suggest, entry would require partnership with a local counterpart, it could be a shot in the arm for a struggling domestic network like Renren. Since Facebook no longer has any hope at achieving Internet supremacy in China, its entry represents little more than creating jobs that otherwise wouldn’t exist. It could also be an opportunity for a local Chinese company to collect foreign technology and techniques. But perhaps an even more compelling reason is image. 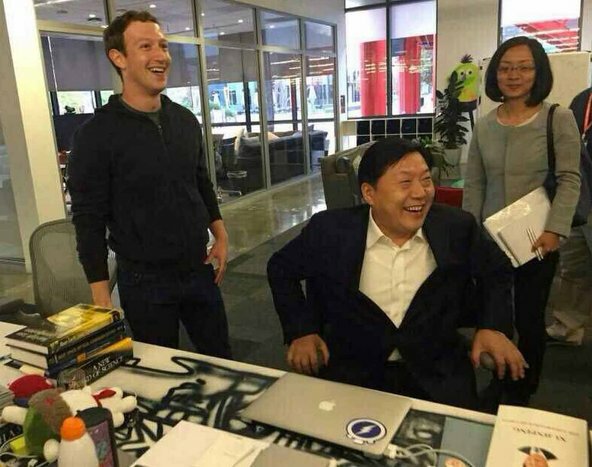 If Facebook entered China, it would be a PR coup for the CCP. Chinese leaders and media could point to the unblocking both domestically and internationally as proof that its internet is opening. Of course, it would be nonsense. If Facebook were to enter, it would have to be on Beijing’s terms, which would entail the same rigorous self-censorship and oversight by authorities that domestic Chinese sites are subject to. It could even require turning over user information. But Zuckerberg’s “kowtowing” to the very man in charge of this apparatus suggests this is something Facebook is entertaining. The question is: is it worth it? From a moral perspective, it would immediately open Facebook to condemnation around the world for compromising on freedom of expression. The company could take the optimistic stance that Google once did, saying that being in China under restrictions would still have a more positive impact than not being there at all. But this wouldn’t likely appease human rights activists. The company could even get dragged before congress in the U.S. to answer for its moral compromise, much like Yahoo was in 2007. From a financial perspective, it’s a bit murkier. If Facebook thinks it’s going to join the ranks of Weibo and WeChat as a major social media player in China, it’s in for some severe disappointment. But in a country with an internet population of 650 million and rapidly growing, even carving out a small niche could make the decision to enter viable. But again, the question for the man already worth $30 billion, is it worth it?